Murphy is visiting. 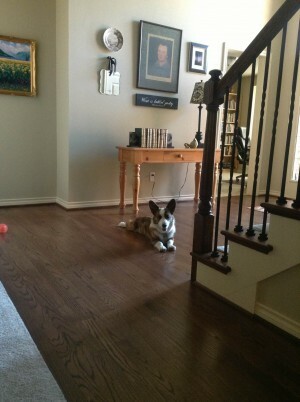 He’s an energetic one-year-old Cardigan Corgi, and he is adorable. Mike and Jessica are here too. Jan stopped by yesterday to say hi. Since she lives right behind us, it was easy for her to pop in. Then Aunt Louise and Marie stopped in bearing many gifts. Four bottles of Cupcake wine, feta cheese pizzas, chocolate molten cakes, pretty little treasures for the house. Al left this morning for his NASCAR race weekend. Mike and Jessica are going to a Tiger game, and I have a work luncheon. But we will all meet back here tonight:) And tomorrow night Mom will get to see her grandson. As she has repeatedly told me, “I just want to see Mike!” So that works out. Whew. I start work Tuesday and am not completely ready. I want to attend the meeting/lunch before I commit my syllabus to the copy center. There may be new things I need to add. And I’ll be meeting my new dean, who has been very patient and supportive of me during my time off. Also, don’t think I’ll get the next book done before school. That’s fine. You might notice that Mike put the image of Blue Heaven with the other widgets on the side of my page. You click it to buy. But of course all of you who read this should know: Blue Heaven will be free exclusively on Kindle October 1-5! Timing is everything and it sounds like it’s all falling into place for you. Enjoy! I’m a little overwhelmed about school prep, vacation plans, and the sheer number of house guests. It’s been fun but I’ve got school work to do tomorrow. Then I can play until Tuesday. Thanks for your support, Sharon.